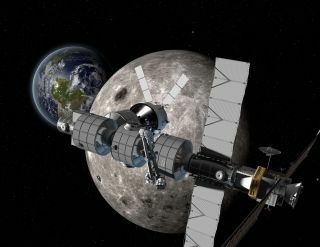 An artist's rendition of a cis-lunar space station, which the Boeing spaceflight company has proposed as a stepping stone on the path to human missions to Mars. LONG BEACH, Calif. -- The aerospace company Boeing has a grand plan to build a crewed space station in orbit around the moon, a sort of lunar proving ground for the technologies and procedures needed to send astronauts even farther out, to Mars. "If we're thinking about going that far away to Mars, we need to take a kind of interim step," said John Elbon, Boeing's vice president and general manager for space exploration, in a closed-door presentation for journalists at a major industry conference earlier this month. "And to take the capabilities that we're developing on station, take them to the next level and test them a little farther away. And that's the idea of going to cislunar space." Elbon spoke about the company's ambitious plans at the American Institute of Aeronautics and Astronautics (AIAA) Space 2016 meeting in Long Beach, California. Crews would spend the rest of the 2020s evaluating environmental control and life support, habitability, logistics, operational procedures and vehicle systems in the radiation-rich environment of deep space, Elbon said. Under the Boeing plan, a mission to Mars orbit would follow in the early 2030s, with a landing on the surface to follow in the mid- to late 2030s. Getting astronauts to the surface of the Red Planet will require the development of specialized skills and technologies. The Boeing company things those things could be developed in a cis-lunar space station. In contrast to a lengthy Mars mission, living and working aboard the International Space Station is comparatively easy. Crews can come home quickly in an emergency, communication is almost instantaneous, the station can be easily resupplied and the facility and its occupants are protected from radiation by the Earth's magnetic field. Mars crews and their vehicles will need to operate more autonomously from mission control, due to time delays caused by distance, Elbon said. For several weeks, there will be no communication between Earth and Mars when the planets are on opposite sides of the sun. Astronauts aboard the cislunar station could add time delays to communications to simulate this effect. "And then we can take that complex on journeys away from here, and be perhaps a month or so away from getting back to Earth," he added. The station could serve as a staging ground for governments and private companies that are interested in exploring and developing the moon. "Our idea would be to build a complex there in the area of cislunar. From there, if folks want to, they can go up and down to the lunar surface," Elbon said. "The Europeans seem excited about doing that. There would be that opportunity. We could practice controlling robots and explore the far side of the moon. But, mostly, we could practice living in deep space and what that would be like." Boeing's plan is aligned with that of NASA, which is planning to test out the Orion spacecraft in cislunar space. Boeing is already working on a prototype cislunar habitat under the space agency's Next Space Technologies for Exploration Partnerships 2 (NextSTEP-2) program. In addition to Boeing, NASA also awarded contracts in August to Bigelow Aerospace, Lockheed Martin, Orbital ATK, Sierra Nevada Corporation and NanoRacks. Boeing's plan for Mars is much less aggressive than the one proposed by Elon Musk. The SpaceX CEO has outlined a plan to launch an automated Red Dragon spacecraft to land on the surface in 2018. Additional Red Dragons would follow every two years, followed by a human flight to the Red Planet in 2024. Elbon said that while Musk's plans are positive in that they are getting people excited about going to Mars, Boeing believes a more gradual approach is required. "To some degree, you know, we've been doing this since McDonnell Douglas, who is one of the companies that is now part of Boeing, was making Mercury capsules that put John Glenn into orbit," he said. "So we have a real pragmatic, practical approach to this. We have an appreciation for how difficult it is. It does causes us to think about we would do things."